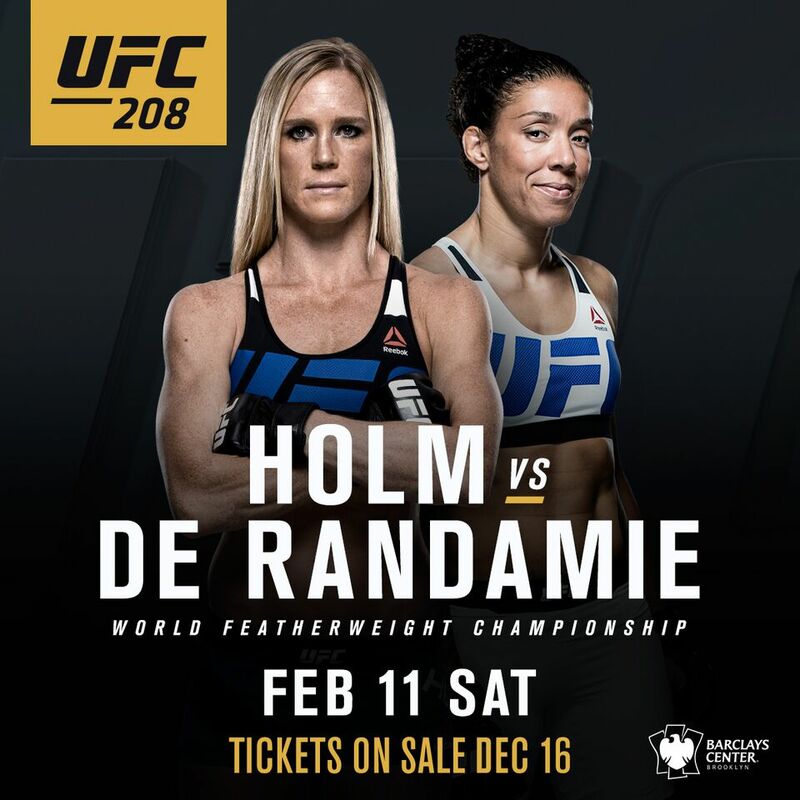 When the Octagon lands in Brooklyn, New York for the first time on Feb. 11, it will be a historic night, as the UFC unveils the women’s featherweight division for the first time, with Holly Holm and Germaine de Randamie battling it out at UFC 208 to become the promotion’s first female world champion at 145 pounds. This five-round championship bout, which airs live on Pay-Per-View from Barclays Center, is also a must see because it pits two of combat sports’ greatest strikers against each other, as three-division world boxing champion Holm squares off with three-division Muay Thai champion de Randamie. Tickets for UFC 208 go on sale to the general public on Dec. 16. UFC Fight Club members will have access to tickets on Dec. 14, and those who subscribe to the UFC newsletter may buy tickets on Dec. 15. Tickets may be purchased at www.ticketmaster.com. The fighting pride of Albuquerque, New Mexico, Holly Holm is one of the most decorated combat sports athletes of this era. A three-division world boxing champion widely considered to be an all-time great in the ring, Holm moved to MMA full-time in 2013, and by November of 2015, she had shocked the world with a second round knockout of Ronda Rousey that earned her the UFC women’s bantamweight title. On Feb. 11, “The Preacher’s Daughter” can make headlines once again if she can defeat de Randamie to become only the fourth fighter in UFC history to win titles in two weight classes. Intent on making some history of her own in Brooklyn, the Netherlands’ Germaine de Randamie first made an impact on the sports world by going 46-0 with 30 knockouts in her pro Muay Thai career. Described by some as the female Anderson Silva, de Randamie won two fights in Strikeforce before debuting in the UFC in 2013 with a win over Julie Kedzie. In her last two bouts, Utrecht’s de Randamie picked up a pair of knockout victories over Larissa Pacheco and Anna Elmose, setting the stage for her first title fight in February.